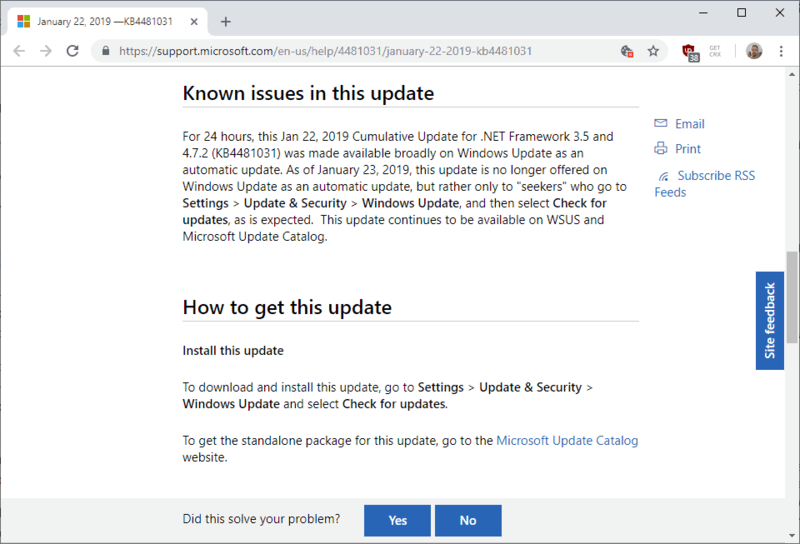 Microsoft released KB4481031, a cumulative update for the .NET Framework 3.5 and 4.7.2 for Windows 10 version 1809 and Windows Server 2019 on January 22, 2019. Several things were odd about the release: The patch was labeled as a preview, and it was available if users clicked on the "check for updates" button manually but also automatically through Windows Update. Some administrators thought that Microsoft made an error in the documentation of the update -- which happened in the past -- while others that someone at Microsoft pushed the wrong button, again, to push an update to devices run by admins who were not seeking for it actively. There is a reason why it is recommended to never hit the "check for updates" button manually on a device running Windows; it may push preview updates to stable versions of Windows or new feature updates that may not be ready yet for prime time. The cumulative .NET Framework update was listed as a preview update and as such, should never have been offered as an automatic update on Windows Updates. Microsoft updated the support page of the cumulative .NET Framework update. The company removed the "preview" label from the title and added a known issue to the description. The known issue describes an issue that is no longer in effect. Microsoft confirms that it distributed the KB4481031 update as an automatic update on Windows Update; this happened for a period of 24 hours before the delivery mechanics were changed. The update is still available to users who click on the "check for updates" button in the Windows Update interface, and users who access it using WSUS or the Microsoft Update Catalog. No word on whether the updates will get removed from devices automatically but my guess is that won't happen. Administrators may want to check if the KB4481031 update is installed on devices they manage and remove it unless the update fixes an issue experienced on the devices. Mistakes happen, but these kind of mistakes should not happen considering that they may push updates that are not ready for wider distribution to a large number of devices. I'm not sure how Microsoft vets updates before they are added to the automatic update distribution queue, but the use of "preview" should have been enough to verify if that preview update should indeed be added to the queue. I got hit with this crap. I uninstalled it via the appropriate process. Install history still says it’s successfully INSTALLED yesterday (2019-01-23). Yes, but if you look at the ‘Uninstall updates’ page, you should see that the update no longer appears in the list. The ‘Update history’ page shows if and when an update was installed, but doesn’t reflect uninstalls. At the bottom of https://support.microsoft.com/en-us/help/4481031/january-22-2019-kb4481031, the ‘File Information’ section shows that files were installed only for 64 bit systems, nothing for 32 bit. So either the update is incomplete, or its installation on 32 bit systems (mine) is unnecessary. yeah you guessed it. Clown Car windows is at it…..Again.!!! is it leaving behind some cruft that Autoremove didnt get. Oobsolete packages or updates etc. but I can never get the phrase typed in right. i did it once thru the package manager. See, I dont do Command line…Dont need to…. My feeling is that my Linux Mx-18 is as good as XP was in its day.. WHich is me saying its WAY way better than W8.1 or W10 or anything newer from microsoft. Microsoft can neither make a useable OS nor even patch it anymore. EXCEPT the one about WINE for Linux. So put that in your Cogitator…..
“My feeling is that my Linux Mx-18 is as good as XP was in its day.. WHich is me saying its WAY way better than W8.1 or W10 or anything newer from microsoft”. Windows 8.1 is an outstanding stable OS. Too bad MS doesn’t give feature support for it but as is Win 8.1 is near perfect, definitely not the buggy fragmented mess that Linux continues to be. Windows 8.1 is an outstanding stable OS. In My Opinion both of theses are spyware/malware. but have never owned an android phone. Which, I believe, can only track me by triangulation. definitely not the buggy fragmented mess that Linux continues to be. This Makes me wonder when the last time you tried it was. I agree not every linux will run on every computer. more due to the manufacturers declining to work with Linux than Linux itself. I began struggling with Linux in maybe late 2013. I had a hell of a time.I was using oddball cheapy laptops from best buy. I now own older out of service mainstream business machines. I guarantee MX-18 will run on Hp 6300,HP 600 G1, Probook 6470b. probably better than w7 runs on them…..
Microsoft trying to horn in on their market. I dont use it … cant vouch for it. I dont like Steam as a company either. I use Mint Linux, I think it’s great. Used it for many years and haven’t had one problem besides some driver support for ~2004 mobo of nvidia. The base OS might be good. But sorry friend, Win 8/10 expose severe issues with privacy invasions, UX issues, and shoddy untested machine breaking updates. Win 8/10 also claim the prize for the worse UI I have ever seen… a half baked cell phone UI for a desktop/server is just plain stupid. I've been an MS dev for 20 years but this year, thanks to the Win 10 fiasco, all new work is on Linux with plans to migrate existing systems as they need mods. Put another way, MS is being phased out of our lives. PS: I'd put Linux Mint up against any version of windows any day. It's the most beautiful and usable OS since tweaked & modded XP; MS' last decent shell. I handle most updates for Windows 8.1, except for Windows Defender, through the Microsoft Update Catalog, after checking this site for security updates only. Thanks Martin! For Ubuntu I use Software and Updates. Did Microsoft confirms it distributed KB4023057 3 times already, in error ? I blocked it again with WuMgr. In other news, Microsoft confirms it distributed Windows 10 in error. After listening to feedback from uses Microsoft also confirms it will sunset its Windows 10 experiment to renew focus on Windows 7, contribute to the WINE and SAMBA projects, release ActiveSync for postfix/courier and remove all telemetry and data gathering components from all its software. .NET Update should be renamed “.NET Break”. It’s one update that should always be done manually and individually outside of all other updates because it’s the one that ALWAYS breaks and needs to be reversed. You can install a hundred other Windows Updates at once and almost all will go through. Try to install 3 .NET Updates at once and I guarantee one will break. And this has been true since Windows XP. It’s pathetic. The incompetence is breathtaking. I just checked my installed updates (using WuMgr_v0.8g) to make sure i hadn’t installed this by mistake and i noticed i have another LTSC update already installed (i’m on 1809 pro) . listed under security updates . I have no idea how they got there ,i didn’t use my wsus tool to install those ,it’s not something i would do. So unless there’s just something else very odd going on with my OS it looks like this is not the first time this has happened. is this KB4480056 caused a problem for you? I’ve spent most of the day on MX 18 Linux ,30mins after booting up win10 and i’m seeing borked updates again. I presume you mean borked Windows not borked MX-18. Everyone reading this has tech skills, but think about all the people who don’t who have their computers trashed by Microsoft’s broken updates. All these people reinstalling Windows and not even knowing that it could have been avoided by not updating. In worse cases they have to pay for tech support or assume their hardware is broken. Think about all the time thousands of people around the world are losing fixing Microsoft’s mistakes. There needs to be a class action lawsuit or something to force Microsoft to change their update policy. Microsoft will never learn until some court fines them with a $1Trillion for damages. Microsoft confirms it distributed Windows 10 in error. Correct saying is : Windows confirms Microsoft is distributed in error ! I *never* install “Preview” updates, always hide them in fact. Looks like Microsoft wants to trick people into being beta testers if nobody will take the bait. Thanks a lot for mentioning this, Martin. I just finished setting up a new computer yesterday and that was indeed one of the updates I noticed in passing. If it borked my computer, I’m going to be seriously upset. I’ll move over to that other computer and see if I can remove that update still. As for updating manually by hitting the “Check for updates” button, what do you propose that I do? Allow M$ to have their way with my computer? I don’t even like the system calling out to check for updates when I’m not looking. Trust me, if there’s a way to exploit that method, Microsoft has already figured it out and implemented it. Well I’ll be. I checked out both of my W7 computers, including the new one, and neither had the update added. Guess I was wrong. Tempest in a teapot and all that. So, what is the recommendation here?. Do I uninstall this update or let it roam along? The reason why I am asking is because I have it in the update history and so far nothing is broken. It is preview software. I’d remove it because of that but that is just my opinion, not a guideline. Thanks, Martin. I think that’s the right thing to do since it was not even supposed to be in this release. I am really starting to wonder what’s going on at Redmond. More and more, it looks like there is an egregious lack of communication between the different departments, to say the least.